We all go through tough times in life, and when we do it’s easy to feel completely helpless. But even though we can’t control what happens to us, we can always hold on to our faith. The Clark family have had their share of difficulties recently. Their previous home was full of black mold and asbestos that was making the family sick and causing financial problems. But the resilient family took matters into their own hands and decided to build their perfect home from scratch instead. The family worked together, putting love, sweat and tears into their forever home. They were also dilligent, making sure that everyone in the family was aware of the safety precautions they needed to take on the building site. The whole family was well-versed in health and safety. But, on January 11th, an unexpected accident turned the fmaily’s life around forever. Chloe and her sister were playing outside together at the back of the house, where they had been told to stay for safety reasons. Dad Jared turned away from the girls to continue working on the house. In that second, he lost hold of a 48 pound plank of wood. What Jared didn’t know was that Chloe had just run around to the front of the house – and right into harm’s way. “As I watched the 48 lbs OSB fall from the second story roof, I heard my daughter scream out ‘Chloe got hit! Chloe got hit!’,” Jared writes. Chloe was alert when she was rushed to the hospital, and even appolgised to her dad for running to the front of the house. When they reached the hospital, her injuries were judged to be cosmetic, and Chloe was transferred to another hospital. But just one day later, the 10 year old girl was lifeless. Doctors discovered that Chloe was suffering from bacterial meningitis. The little girl fell into a coma and was put on life support. The outcome looked bleak. But as always, the family clung to their faith. 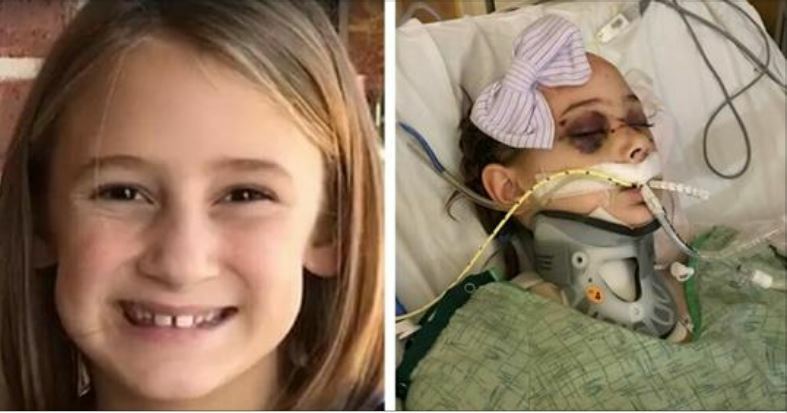 They turned to social media to ask friends, family and strangers to pray for their little girl’s recovery. And sure enough, well wishers across the globe were quick to offer up prayers and support for the family. Then, on January 16th, the family happily announced that a miracle had occured. Chloe regained consciousness and was walking, talking and even playing the guitar and singing with her dad! “God has been so good to us! We have been in awe witnessing the miracle He has done in Chloe’s life,” dad Jared writes in a Facebook post which has received thousands of likes and happy comments. No matter what life throws at us, faith really can pull us through in our darkest hour. Share this story if you believe in miracles, and help us wish Chloe and her family good luck for the future!